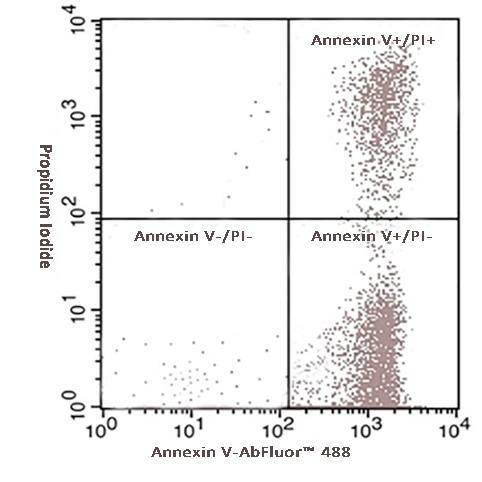 Abbkine Annexin V-AbFluor™ 488 Apoptosis Detection Kit contains Annexin V labeled with Abbkine proprietary green fluorescent dye AbFluor™ 488, which allows the identification and quantitation of apoptotic cells by flow cytometry or fluorescence microscopy. Simultaneous staining of cells with AbFluor™ 488 and propidium iodide (PI) allows the discrimination of intact cells, early apoptotic and late apoptotic or necrotic cells. Fig.1. Hela cells were induced with camptothecin for 24 hours and stained with Annexin V- AbFluor™ 488 Apoptosis Detection Kit. The cell is a late stage apoptotic/necrotic cell with both Annexin V- AbFluor™ 488 and PI staining (green membrane with red fragmented nucleus). Fig.2. Hela cells were induced with camptothecin for 24 hours and stained with Annexin V- AbFluor™ 488 Apoptosis Detection Kit. The combination of AbFluor™ 488 and propidium iodide allows for the distinction between early apoptotic cells (Annexin V- AbFluor™ 488 positive), late apoptotic and/or necrotic cells (Annexin V- AbFluor™ 488 and propidium iodide positive), and viable cells (unstained). Apoptosis is a form of programmed cell death to remove unwanted, damaged, or senescent cells from tissues. In normal cells, the negative phospholipids reside on the inner side of the cellular membrane while the outer surface of the membrane is occupied by uncharged phospholipids (PS). After a cell has entered apoptosis, the negatively charged PS are transported from the inner to the outer leaflet of the plasma membrane, thus exposing PS to the external cellular environment. The human anticoagulant, Annexin V, is a 35–36 kDa Ca2+-dependent phospholipid-binding protein that has a high affinity for PS. Annexin V labeled with a fluorophore or biotin can identify apoptotic cells by binding to PS exposed on the outer leaflet. Propidium iodide (PI) is a membrane-impermeant DNA-binding dye that is commonly used to selectively stain dead cells in a cell population. PI is excluded by live cells and early apoptotic cells, but stains necrotic and late apoptotic cells with compromised membrane integrity. PI can be excited by the 488, 532, or 546 nm laser lines, and emits red ﬂuorescence.